It's amazing how different the landscape is just a couple of hours drive away from Seattle. The Yakima River Canyon's basalt cliffs can rise up 2000 feet. 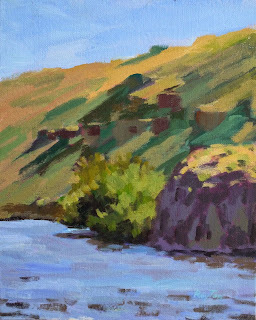 I painted this scene under a pedestrian bridge with Melanie Thompson and Laura Gable, a couple of friends from Plein Air Washington's Eastern Washington contingent. You can read about it at the Plein Air Washington blog. I am PAWA's blogger now, I think because I am one of the more active attendees of these plein air paintouts.